In 2003 S.T. Dupont celebrates the bicentenary of 1804 Napoléon coronation with a unique collection of limited edition objects engraved with Napoleon's profile and his coat of arms, an eagle. 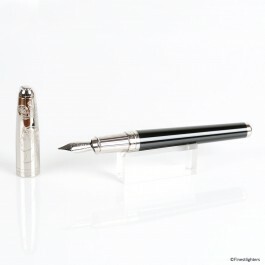 This is the Napoleon Limited Edition Olympio fountain pen, decorated with platinum and black Chinese lacquer. Launched in 2003, only 1500 individually numbered pieces of this pen were made. Please note: there are two small dents on the cap (see the last picture). There are two small dents on the cap (see the last picture).